One of the signs of aging is the loss of firmness. As we aged our skin starts to sag, so we will lose facial feature definition. Conversely, water retention and puffiness around the jaw line and chin areas exacerbate the loss of youthful facial contour. Some will go to aesthetic surgeon for help to reshape their facial features but what if we could sculpt our jawline while taking care of our skin’s daily needs non-surgically. Here I am trying out swiss line Cell Shock Overnight "V" Mask. What is so special about this swiss line Cell Shock new Overnight "V" Mask? Discover the art of sculpting face without a scalpel. It is a Non-Surgical face slimming that comes in a set of 2 items which is the Sculpting Patch-Mask and the Lifting Infusion-Mask. They are not only act as shape transforming facial mask, lifting the facial contours where needed and sculpting where puffiness or sagging has compromised the oval shape of the face but also as a night cream. Welcome to the new era of facial architecture and skincare. This set of mask is awesome for those who is busy, wanted to look good and don’t like to apply too many products. The Sculpting Patch-Mask is presented with a cold-metal massage roller applicator formulated to drain and slim the contour of the jaw line and the under-chin areas. The Lifting Infusion-Mask acts like a second skin to seal active ingredients and deliver night-long benefits and transforming results. Why you need the Overnight "V" Mask? 1. If you are concerned with multiple signs of aging: lifeless skin, loss of firmness, wrinkles, double-chin and loss of oval facial shape. 3. If you are looking for a new skincare ritual… a more exciting night-time solution. Before you start using any products, please understand and learn the correct way of usage to enhance the efficacy. The Overnight “V” Mask may be applied 2 or 3 times per week, for an intensive cure or alternatively it can be used every night for as long as needed. However, the first week I use every night and then followed by alternate days. 1) Cleanse and tone our skin as usual and then use our usual serums or ampoules, eye care and neck care. 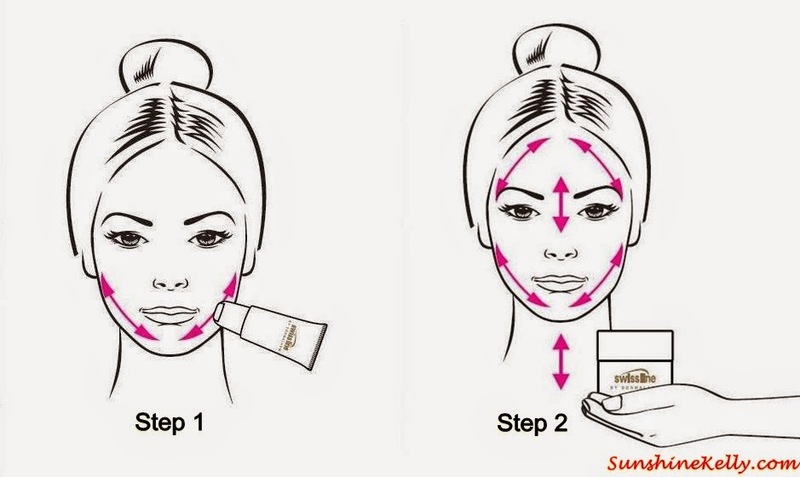 2) Use the Sculpting Patch-Mask roll-on applicator to roll the product on along the jaw line and under-chin areas as you apply a gentle pressure to the tube. Only a small amount of the product is needed as the gel forms a “patch” and there is no need to apply more than a very thin veil. Smooth the gel with the fingertips as needed to even-out the application. Please take note, for security during travelling and also to keep the roller clean after each use, the tube has an ON/OFF lock system. It should be kept in the OFF position at all times and only switched ON for application and then switched OFF again after that. 3) Apply the Lifting Infusion-Mask over the entire face, neck and décolleté while making a soft draining massage as per the drawing below. When removing the mask from the jar use circular movements with your finger so as to “melt” and activate the second-skin film texture, thereby making the application of the mask even more enjoyable. Please take note, the Lifting Infusion-Mask belongs to a new generation of masks which work while you sleep… it should not be tissued-off or rinsed-off like a common mask. So just leave it overnight because it acts as your night cream too. Well, if you feel the need to apply your usual night cream on top of the mask you can do it but this should only be done in the case of very dry skin conditions. As for me, after I applied the Lifting Infusion-Mask I din’t appli anymore products. Stick your tongue as far out as possible, facing the tip of your tongue upward. From that pose, tilt your head back until a vertical line forms between your neck and your lower jaw, and hold for 10 seconds. Do 2 sets of this pose. Pucker your lips, as shown in the center image below, and then slide your puckered lips form one side to the other. Do it 3 or 4 times successively, with 30 second intervals. Overall, the swiss line Cell Shock Overnight "V" Mask is very convenient and multi-function. It can be leave on mask at the same time as night cream. The mask is suitable for dehydrated skin users. After using it for more than 14 days consistently I can feel that the skin below my jawline (chin is firmer) and the laugh line is lighter. My overall skin on my neck and face feel firmer and moist. However, I have not achieved the V-shaped jawline that I desired yet so I will continue using it till I finished the set and see more improvements. The marvel of the Cell Shock Overnight “V” Mask efficacy is derived from a host of cutting edge actives. It is formulated with Swiss line’s exclusive signature ingredient, the Cellactel 2 Complex, world renowned for maximizing cellular turnover and a V-Slimming Complex, that Swiss line scientists have formulated for the product. The V-Slimming Complex consists of the synergistic actives of Gingko and Butcher Broom. Price: Swiss line Cell Shock Overnight “V” Mask is retailed at RM768. Availability: Swiss line products are available at over 50 Cheerful Beautique member beauty salons nationwide in Malaysia, including Energy Day Spa at Great Eastern Mall (Ampang) and Damai Sari (Mont’ Kiara).